Where geoscience students earning their degrees (Bachelor's, Master's, and Ph.D.'s) in 2000 were hired. Data from the American Geosciences Institute. Written by Carol Ormand and added to by Molly Kent, based on ideas compiled from the 2007 workshop on the Role of Departments in Preparing Future Geoscience Professionals and the 2013 Geoscience in the 21st Century Workforce workshop. The landscape of career opportunities in geoscience is constantly changing. To help your students prepare for their future careers, you need to know what their options will be. Here are some predictions based on recent trends. According to these experts, the future of geoscience looks promising. In this article in Environmental Science and Technology (2010, v. 44 (2), pp. 550–555), Leila Gonzales and Chris Keane, of the American Geosciences Institute, point out that society's need for geoscientists exceeds the current number of geoscience students, and that the workforce shortage is expected to increase. They explore the reasons for this shortage as well as possible solutions. AGI publishes an annual report on the status of the geoscience workforce, based on original data collected by AGI as well as from federal data sources, professional membership organizations, and industry. The report integrates these data into a comprehensive view of the human and economic parameters of the geosciences, including supply and training of new students, workforce demographics and employment projections, to trends in geosciences research funding and economic indicators. See the Status of the Geoscience Workforce 2014 report. Roman Czujko, from the Statistical Research Center at the American Institute of Physics, gave this presentation at the 2007 Workshop on The Role of Departments in Preparing Future Geoscience Professionals. Jobs are available in the geosciences, and geoscientists report a high level of job satisfaction. Chris Keane's gave a presentation at the 2007 workshop on Strategies for Successful Recruitment of Geoscience Majors detailing the current trends in geoscience employment, as well as what skills employers are looking for. This talk lasts 19 minutes. 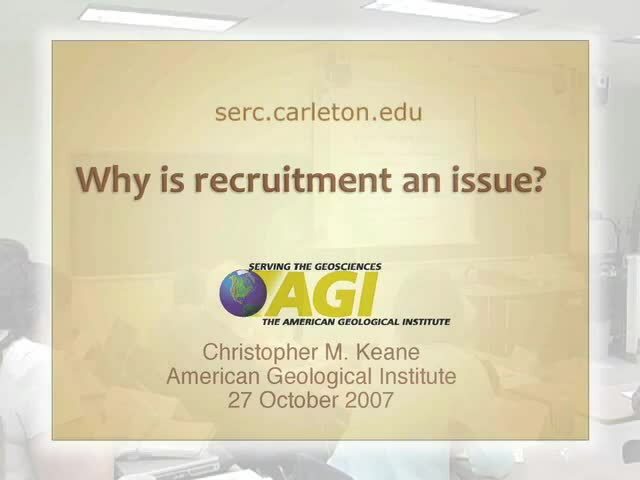 Chris Keane of the American Geosciences Institute made this presentation at the 2007 Workshop on The Role of Departments in Preparing Future Geoscience Professionals. In the coming decade, demand for trained geoscientists, particularly in the private sector, is projected to exceed supply by a significant margin. 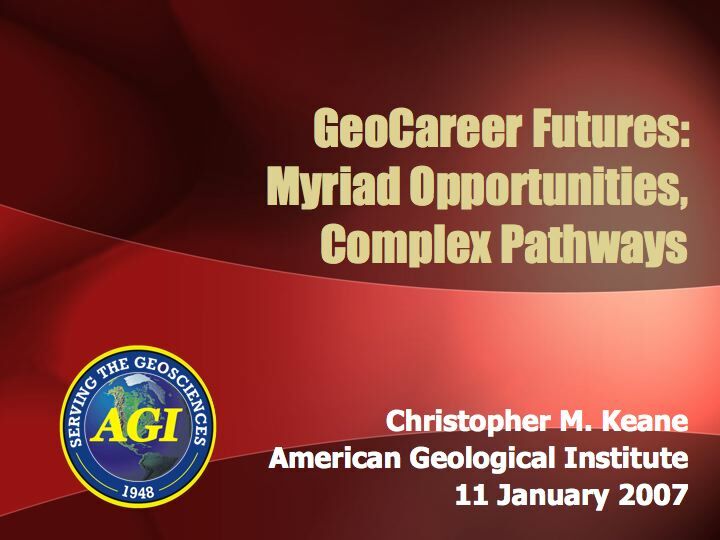 This presentation was given by Christopher Keane of the American Geosciences Institute at the the 2005 Workshop Developing Pathways to Strong Departments for the Future. 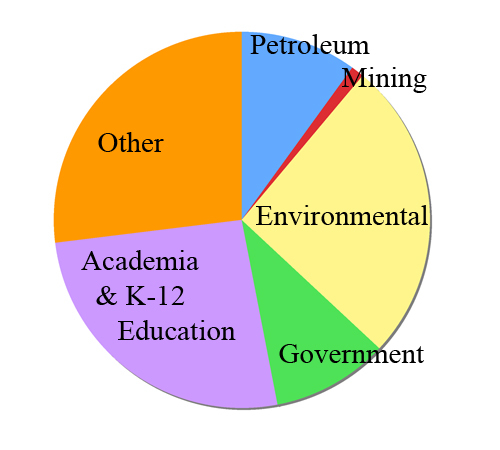 Using AGI data, he provides a snapshot of the "health" of the geosciences in academia, industry, and government, measured via factors such as economic growth and public perceptions of the relevance of the geosciences. This page discusses the many career paths available to geoscience graduates, from policy and education to research and law. It is based on the work of Deborah Bathke (University of Nebraska at Lincoln), Dave Mogk (Montana State University-Bozeman), Megan Pickard (Brigham Young University-Idaho), Craig Schiffries (Carnegie Institution of Washington), Karen Viskupic (Boise State University) and Carolyn Wilson (American Geosciences Institute) at the 2013 Geoscience in the 21st Century Workforce workshop. U.S. Geoscience Salaries Continue Upward Climb, from the American Geosciences Institute. These data show the rapid increase in geoscientists' salaries from 1999-2008, including data by subdiscipline. 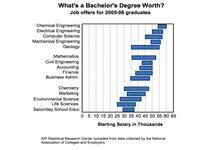 Geoscience Starting Salaries for 2010 Graduates, from the American Geosciences Institute. 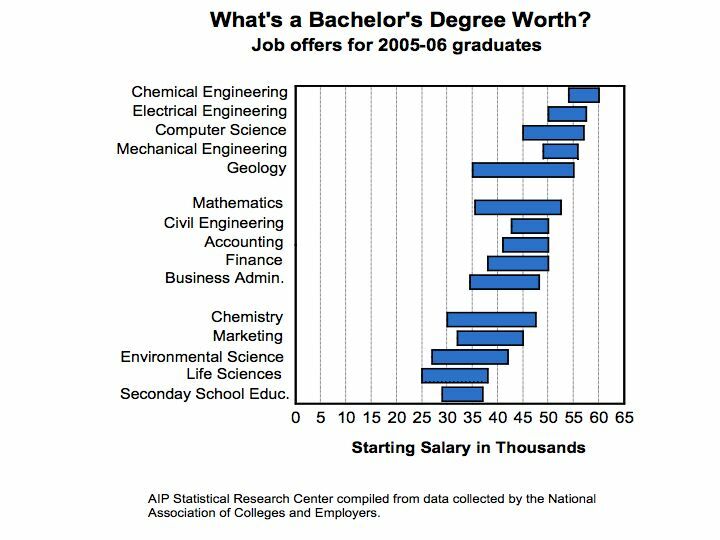 These data show starting salaries for geoscientists with Bachelors, Masters, and PhD degrees, and compare them to starting salaries for graduates in other disciplines. Occupational Employment and Wages, May 2005, from the U.S. Department of Labor's Bureau of Labor Statistics. These data are for geoscientists, except hydrologists and geographers. They also do not include teachers and professors. For data on those occupations, see the Department of Labor's list of occupations. Employment Statistics for Geosciences in the U.S. includes geoscience employment data by employment sector, by geographic region, and more. Data from AGI. 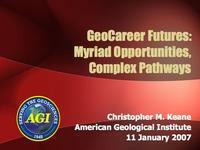 Geoscience Careers Forecast from the Sloan Career Cornerstone Center. American Geosciences Institute, 2009. Student Perceptions of Geology and Implications for Choosing Among Different Science Majors . This article summarizes the results from interviews of nearly 800 students at Northern Arizona University in 2008-2009. The interviews focused on students' attitudes toward science major programs. The study highlights students' misperceptions about geoscience careers, particularly salary expectations: students significantly underestimate starting salaries for geoscientists. This article asserts that the oil and gas industry's biggest challenge is insufficient human resources to meet society's appetite for hydrocarbon resources. Chris Keane speaks about recruitment issues.